Staff Nurse vacancy in Jubilee Mission Medical College and Research Institute, Thrissur. Interested and eligible candidates can apply . More details given below. Jubilee Mission Medical College and Research Institute is a private medical college located at Thrissur in Kerala, India. The establishment is administered by the Jubilee Mission Hospital Trust, a charitable organisation under the Catholic Archdiocese of Thrissur. 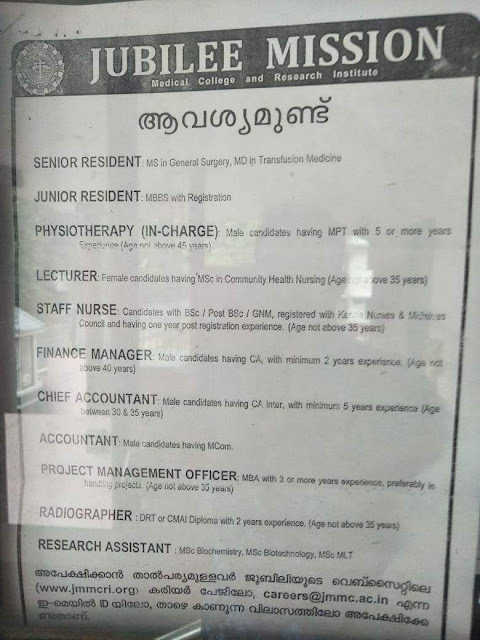 Experience : Candidates with minimum 1 year post KNMC registration experience.